These Instant Pot Baked Beans with Bacon are the easiest and most delicious baked beans you could ever eat! Even sweeter, there is no need to soak beans! 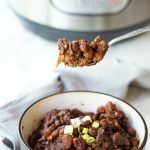 By cooking these Baked Beans with Bacon in your Instant Pot, you will end up with a sweet and savory side dish perfect for any barbecue! Place beans and water into pot and set timer for 60 min. Followed by the remaining ingredients in no particular order. Close lid and set timer for 30 min manual high pressure.